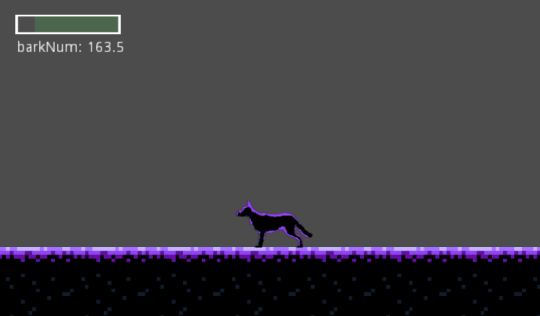 Development log for my entry - A Bark in the Night. The premise: A dog must chase away unspeakable horrors in the dark hours of the night before they reach it's home. In the shadows, a cat watches menacingly. 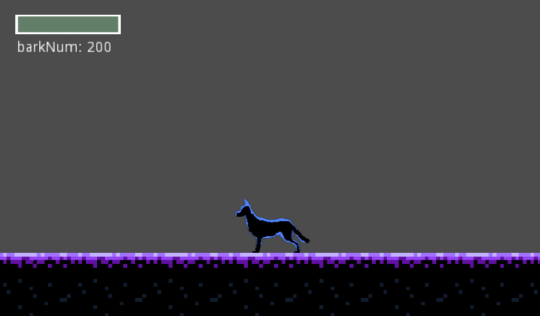 Day 1 was spent creating the basic game mechanics, specifically for the dog. I've heard anecdotally that if a character isn't fun to control in an empty room, it won't be fun to control no matter how many features you add in. So I decided to dedicate the initial period of the jam honing the player controls. Currently there is still some adjustment to be made, but I'm honestly surprised it came out as functional as it has. I've also added in a screenshake effect whenever the meter is full and the player barks. Oh I really like the idea of playing as a brave dog, and the colours in the screenshots look really nice as well. Yeah graphics and ideas are greate! ohh this is a solid design start so far! it's awesome to see the bar implemented already. as an accessibility side note i would be careful though of sound only cues as mechanics--not all people can appreciate them! Ah! I didn't think about that situation. In the final version I hope to have lighting effects, so adding in a few of those along with the sounds should help resolve that. Thanks! Hey everyone, I decided to make a video post for Day 2's progress! 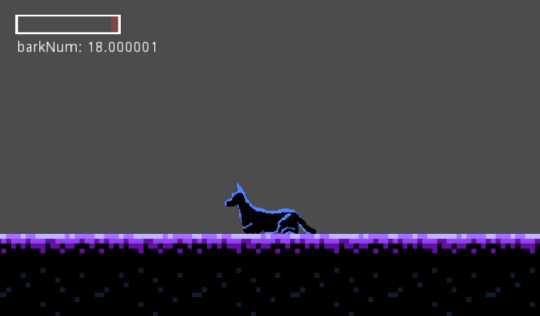 I've implemented the first monster in the game, and have time based nights. I plan on spending a day or two planning out the next set of monsters to add in and wrap up the programming end of things. Then I'm off to create the final art, sound, and menus. I like the doorman! Pretty spooky. Good luck planning out more monsters! Thanks! I'm having a lot of fun thinking of possible monsters to add in. OH MAN i love how that monster looks and the fade out is a really nice effect!! Thanks! The monster art is placeholder, so hopefully it'll get an upgrade! this game's design is looking great so far; the color palette is really lovely! i'm super into the camera movement and the monster (that fade effect! so spooky and neat!! ), too. It's been a while, sorry for the lack of updates! This week I was able to get the majority of the final art done for the environment and the dog. Unfortunately, the dog animations are sort of lost in the video capture due to the lag. I'll try to remedy that by putting together some gifs. The vengeful spirit of a shut in that now possesses an old television set. Bad Channel will start to act up and give the player 20 seconds to fight it off. This enemy takes a good bit more damage than Doorman (who has now been nerfed to be much easier to dispatch) and is meant to pile on the urgency as it requires the use of more bark energy to defeat. To combat the chance of being overwhelmed by just 2 monsters, I've added in a dog house where the player can rest to double their recovery rate. This also adds in another element of strategy, as it is far removed from where two of the monsters spawn. Work still continues on the remaining 4 monsters.